The cell. 3. Cell membrane. Adhesion. Atlas of plant and animal histology. Cells of pluricellular organsims are organized in tissues and organs. In animals, this organization largely depends on the ability of cells to adhere to the extracellular matrix or between each other. Cell adhesion relies on transmembrane proteins, known as adhesion proteins, found in the plasma membrane. These proteins made possible the emerge of animals during evolution, all of them pluricellular organisms. Actually, the adhesion proteins are very similar when comparing the different animal groups, including marine sponges. Adhesion is not just for anchoring and placing cells to form tridimensional structures, but also for communication between each other. In other words, the type of adhesion and to what a cell is adhered to is a very useful information for the cells. Cells move through tissues by way of adhesion. Cells don't swim, but crawl. For traveling, cells first need to be attached to some element of the environment, a cell or molecules of the extracellular matrix, and then drag the nucleus and the rest of the cytoplasm in the direction of moving. During embryo development, cells can move as coordinated groups. In this case, cells travel together by cell-cell adhesion. Adhesion molecules are found in the plasma membrane. They diffuse laterally but get fixed when they get anchored to an extracellular molecule. One adhesion molecule does not make a strong bond, but cell adhesion is performed by many adhesion molecules that altogether make a strong linking, as if they a were molecular Velcro. Some adhesion molecules may interact laterally between each other and form molecular complexes that increase the adhesion strength in some local points of the cell surface. These are structures know as focal adhesions and adhesion junctions. Cells can regulate the intensity of adhesion and to what molecule they adhere to by way of different mechanisms. For example, cells can change the type and amount of adhesion molecules in the plasma membrane by synthesis, degradation, or hidden them temporarily in internal compartments by endocytosis and exocytosis. Another mechanism to control the strength and specificity of adhesion is by activating and inactivating the adhesion molecules in the plasma membrane. There are adhesion molecules involved in the attachment of cells to the extracellular matrix and others in linking one cell to another. Integrins are probably the most important proteins involved in the adhesion between cells and extracellular matrix, and comprise a large family of transmembrane proteins present in all animals. They are composed of two subunits (alpha and beta) (Figure 1). In mammals, integrins family are formed by 18 alpha units and 3 beta units, that when combined are able to form up to 24 different integrins, which are diferentially expressed depending on the tissue and the physiological state of the cell. Integrins have 3 molecular domains. One intracellular domain which interacts with actin filaments of the cytoskeleton (sometimes with intermediate filaments), one extracellular domain that can bind collagen, fibronectins and laminins, and one intramembrane domain which contain hydrophobic amino acid sequences inserted among the lipid fatty acid chains. The ability of integrins to connect extracellular matrix and cytoskeleton makes it possible a structural continuity between the inner and the outer sides of the cell. Furthermore, integrins may change the behavior of the cell according to the molecular composition of the extracellular matrix (they behave like receptors). This is possible because the adhesion state of integrin is transmitted to its intracellular domain by conformational change, triggering molecular interaction cascades in the cytosol, that eventually may change gene expression. 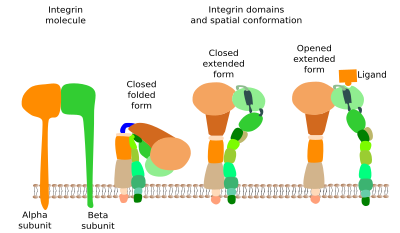 Cells, in turn, may regulate the strength of adhesion by increasing or decreasing the number of integrins, by synthesizing different integrin subunit subtypes, or by changing the adhesion affinity after modulation of the intracellular domain, which in turn will modify the adhesion ability of the extracellular domain. In general, the adhesion strength of integrins is weaker than that of other adhesion molecules. Figure 1. 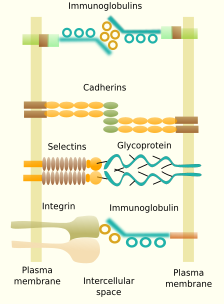 Integrin, states of activity (Modified from Luo et al., 2007). Sometimes, integrins are gathered together in groups to form macromolecular complexes known as focal adhesions and in some cells, like epithelial cells, they form larger complexes called hemidesmosomes. In hemidesmosomes, the cytosolic domain of integrins are connected to intermediate filaments, not to actin filaments. The strength of the adhesion of a cell with the extracellular matrix depends on the number, the active state and type of integrins that are expressed in the plasma membrane. Figure 2. Main adhesion molecules making cell-cell contacts (modified from Hynes, 1999). Some transmembrane molecules make direct adhesion contacts between cells. There are four types: cadherins, immunoglobulins, selectins and some types of integrins (Figure 2). Cadherins are found in most of the animal cells and make homotypic contacts, i.e., they recognize and join other cadherins located in neighbor cells. Cadherins may join lateraly beteween each other to form groups for a higher adhesion strength at certains points of the cell surface. There are more than 100 types of cadherins divided in classic and desmosomal cadherins. The name cadherin stands for calcium and adhesion, because they need calcium to make the adhesion contact. Cadherins are a large family of proteins, with some members specifically expressed in some tissues. For example, N-cadherins are found in the nervous tissue, and E-cadherin in epithelial tissue. This is why they play an important role during segregation of cell populations in tissues during development, but also in adults. Cadherins are particularly relevant during embryonic development. Cadherins are also found as structural parts of desmosomes (macula adherens) and adherent junctions (zonula adherens). Some adhesion proteins belong to the immunoglobulin family and make homophilic contacts with other immunoglobulins located in neighbor cells, although they are also able to make heterophilic contacts. They are also a large and diverse family of proteins with selective tissue distribution. For example, N-CAM (neuronal cell adhesion molecule) is expressed in the nervous system. The binding strength of immnuoglobulin proteins is weaker than cadherins, and it is thought that it is suitable to fine tune the segregation of cells in groups inside tissues. Selectins are another type of adhesion molecules involved in cell-cell adhesion by heterophilic contacts. They bind carbohydrates (sialic acid and fucose) located in the surface of the neighbor cells. For example, they are needed during the exit of leukocytes from blood vessels toward the extracellular matrix of surrounding tissues. Integrins, which mainly participate in cell-extracellular matrix adhesion, are also involved in cell-cell adhesion. For example, some integrins can make heterophilic contacts with certain types of immunoglobulins of neighbor cells. Ocludins and claudins are cell-cell adhesion molécules mainly found in tight junctions of epithelial cells, although they are also found in other tissues.